WASHINGTON – Thousands marched on Washington on Saturday to protest against the US government’s online surveillance programs, whose vast scope was revealed this year by former NSA contractor Edward Snowden. 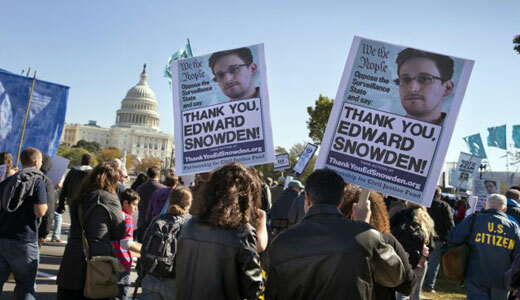 People carried signs reading: “Stop Mass Spying,” “Thank you, Edward Snowden,” and “Unplug Big Brother” as they gathered at the foot of the U.S. Capitol to demonstrate against the online surveillance by the National Security Agency. The march attracted protesters from both progressive and conservative groups in opposition to what demonstrators declared to be unlawful government spying on Americans. Snowden’s disclosures have raised concerns that NSA surveillance may span not just foreign, but domestic online and phone communication. His latest disclosures showed that the United States may have tapped the phone of German Chancellor Angela Merkel, adding to the growing outrage against U.S. data-gathering practices abroad and prompting a phone call between Ms. Merkel and President Obama.